DETAILS: This exquisite new construction condominium home offers all of the incredible amenities of a new condo building, the convenience and beauty of a beachfront vacation, and the exclusivity and luxury you expect in a new 30A property. Featuring 4 bedrooms and 4 bathrooms, this stunning property offers incredible accommodations. Three impeccably decorated guestrooms promise a relaxing and rejuvenating getaway for your group. In the master suite, a plush king bed and a private en suite bathroom with a shower and separate soaking tub await. Guests can choose from two additional guestrooms, each offering luxurious bedding and a private en suite bathroom—one with a shower and the other with a shower/tub combo. This property also offers a study room featuring a queen sleeper sofa and a balcony. This condo is stunning, the view is stunning, the location is perfect and convenient to restaurants and some shopping. It is very family friendly. We had a wonderful time and will be back again! 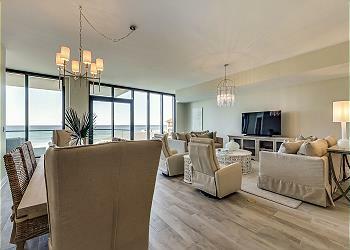 We are so glad that you enjoyed your stay with us in this amazing condo in Blue Mountain Beach! We agree that the location, as well as the view, is spectacular and perfect for the entire family! Speaking of, the photo you shared is priceless! Thank you for staying with 360 Blue, we hope to see you again very soon!